Please come on by STB and join us and while you are there help me welcome our new Surprise Party Guest- Lindsey Martin-Penny. Supplies * MFT Flowers and banner, SU- Stitched Circles, Verve sentiment, the word Smile is something I picked up at Michaels. That’s a beautiful card and a lovely layout. Lovely card Nancy. I love the red & white with the black. I bet your future DIL loved it too. Glad you had a great vacation in Colorado. It looks like you’re having a great Summer break, Nancy!!! Red, white, black and a little bit gray work so well together!!! A classy card for a lady :)!!! Fun card and great design. I love the pretty flowers and lovely colors. Black and white is so classic, and the splash of red, is super. This is a very sophisticated card. Nancy this is fabulous! 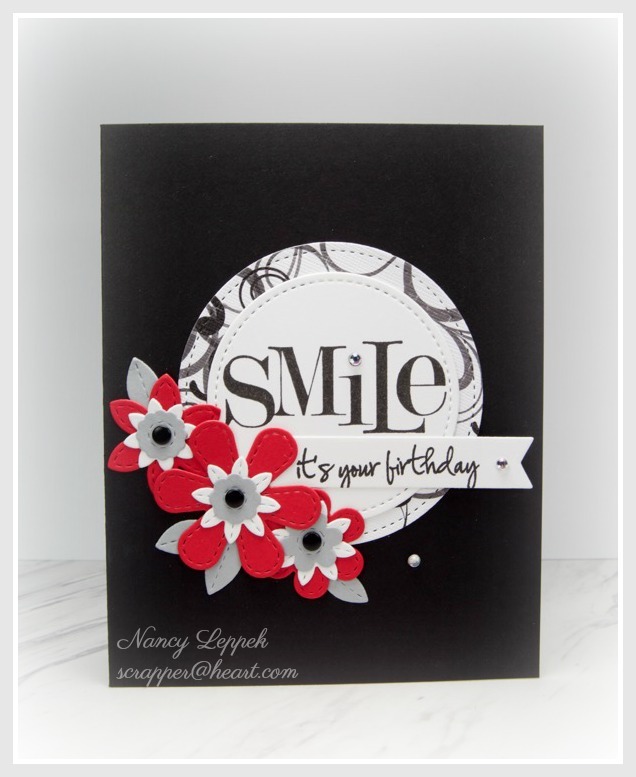 I love the red, gray, black combo and the die cut flowers are beautiful. I need some good stand-alone flower dies, thanks for sending me shopping (again)! Love how dramatic this looks with the black! Really makes the red flowers pop. Thanks for the chance to join you for the next few challenges!